Learn about the wide range of corporate events you can host on the Liberte. Are you tired of having all of your corporate events, whether it is a holiday party or fundraiser, in a stuffy banquet hall? Take your next corporate event on the calm waters of Annapolis with a Liberte charter boat. With the ability to comfortably fit up to 49 people, the Liberte charter boat is the perfect location for small or growing business. There are a variety of events you can throw on a Liberte charter boat and have the whole office wanting to come back. Whether your company has been around for only 5 years or 25 years, you should celebrate the success and longevity of the business you helped build. 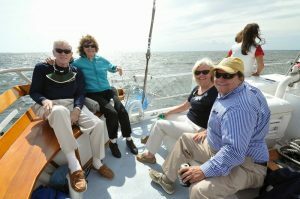 Sailing around Annapolis and into the Chesapeake Bay is the perfect activity to celebrate the hard work of your company. Your employees, along with your friends and family, will enjoy kicking the night off with a champagne toast while feeling the soothing bay breeze. We can cater your event with a delicious menu selection, and you can even treat everyone with an open bar. What better way to announce the launch of a new product or service by throwing a stylish event on the calm waters of Annapolis. Invite all the right people from your sales team to media outlets to even potential retailers on a luxurious charter boat. Our charter boat is a great place to unveil a new product, and then you can celebrate easily right after. Plus the Annapolis waters and the town itself provides great backdrops for product launch pictures. If you want to have a private conversation with an important client and want to expand your business relationship, then take them on a charter boat. The Chesapeake Bay is the perfect location to brainstorm new ideas for your client and to help expand their brand. Your client will appreciate that you took them for a relaxing little getaway in the middle of the day. It is one place where everyone can think clearly and have a successful meeting. Consider A Private Charter On Liberté For Your Next Special Occasion! Liberté provides private charters in Cape Cod and Annapolis as well as public sailings in Cape Cod. Celebrating in the lap of luxury aboard the magnificent Liberte is a great way to create cherished memories that are sure to last a lifetime. If you want to charter Liberté for your next corporate event or wedding reception, contact Liberté today! Call us today and we will be sure to respond within 24 hours. Be sure to also check us out on Facebook, Google +, and Twitter. This entry was posted on Friday, September 29th, 2017 at 3:32 pm. Both comments and pings are currently closed.